Fort Minor is the name of Mike Shinoda's side project, launched in 2005. Fort Minor has released an album, The Rising Tied, in November 2005, along with the mixtape We Major, and a "comeback single" "Welcome" in June 2015. Also in December 2004, Mike told Blabbermouth, “We are trying to change up the pace a little bit. We'll probably be working on a lot of other projects before we get started on the next Linkin park album. We want to give our fans some different stuff, so as not to be redundant. Everyone is looking for great creative avenues to explore. It's no secret that we like to keep working, so it's safe to say that you can expect a number of things from us in the coming months.” He also stated that he was working on a lot of "hip hop production." Styles Of Beyond's management company Spytech Records in April 2005 announced, “xt type deal. Machine Shop Records has the same vision as Styles of Beyond and are here to make changes to the hip-hop game. S.O.B. has also been working on their first major label appearance, “ FORT MINOR ” which features Mike Shinoda ( Linkin Park ), Common, Black Thought (The Roots), Kanye West, Kenna, and more. And catch this…the album is executive produced by none other than (drum roll please) JAY-Z!” They confirmed the appearance of Styles Of Beyond, who would go on to feature on a majority of the album; unfortunately, Kanye West did not guest on the project. To promote the album, Mike worked with DJ Green Lantern on a mixtape entitled We Major, which was released October 30, 2005. Other guests such as members of the rap/hip hop group Demigodz were featured on the mixtape as well as Styles Of Beyond and a few guests that were on The Rising Tied, like Celph Titled and Lupe Fiasco. 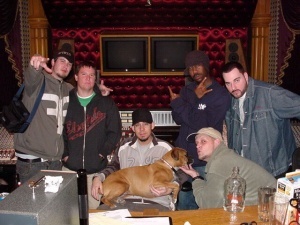 Fort Minor working on The Rising Tied‬ at NRG Recording Studios. The album, The Rising Tied, was released on November 22, 2005 and featured Styles Of Beyond on 6 tracks. Other guests included Kenna, Holly Brook (now Skylar Grey), Joe Hahn, Common, John Legend, Celph Titled, Jonah Matranga, Eric Bobo, and Black Thought. Fort Minor embarked on a world tour starting in August 2005 that continued through May 2006. Due to the big success of the single "Where’d You Go? ", Mike performed two one-off shows with Fort Minor at Summer Sonic Japan in August 2006. These shows were the first time Mike played a Fort Minor set and a Linkin Park set on the same day, which would later be repeated in 2015 in Germany. After August 2006, Mike returned to work with Linkin Park on their next album Minutes To Midnight. For the next few albums, his hop hop ideas were transformed into Linkin Park songs such as "Hands Held High", "Waiting For The End", and "Until It Breaks". In 2015, Mike was working on songs for Linkin Park’s followup album to The Hunting Party when he presented an idea to the band that he felt strongly about, an idea that should be released on its own and performed in the Linkin Park set, but released under the Fort Minor name. In June 2015, Mike released "Welcome", the first Fort Minor release since 2005. To accompany "Welcome", he performed on Conan in June between Linkin Park shows, and played five full Fort Minor shows in Los Angeles and Europe. Since September 2015, there has been no news on further Fort Minor releases, but Mike said he hopes to return to it someday. This page was last edited on 30 June 2017, at 05:00.